Disclaimer: I was provided a gift voucher to use to order a selection of photo canvases in return for an honest review. The review words and opinions are my own. All photos are copyright property of Me Becoming Mum. I am a big fan of photos, and always have been. I have spent many hours of my life taking photos and using them to make scrapbooks, photo books, albums and more. One of my favourite additions to my home, however, were the canvases I bought for John’s first Father’s Day with photos from Squidgy’s newborn photoshoot. When Parrot Print approached me to see if I’d like to review their canvas printing service I of course had to say, “yes”. Here are a few thoughts on the beautiful selection of canvases we have thanks to Parrot Print. You can upload photos from your phone, computer and even social media. The best part about using the Parrot Print website is that no matter where you are you will be able to order and print canvases of your favourite photos. You can choose to upload photos direct from your device or even use Facebook or Instagram to have add some special memories to your home. This means you have the chance to bring those online memories to life, rather than just saving them in a public forum. They come in a number of different sizes and shapes. Whether you are looking for something small, or a larger option there is something for everyone. There are small sizes like the desk canvases I ordered for my parents and John’s parents, which are great and budget friendly too. 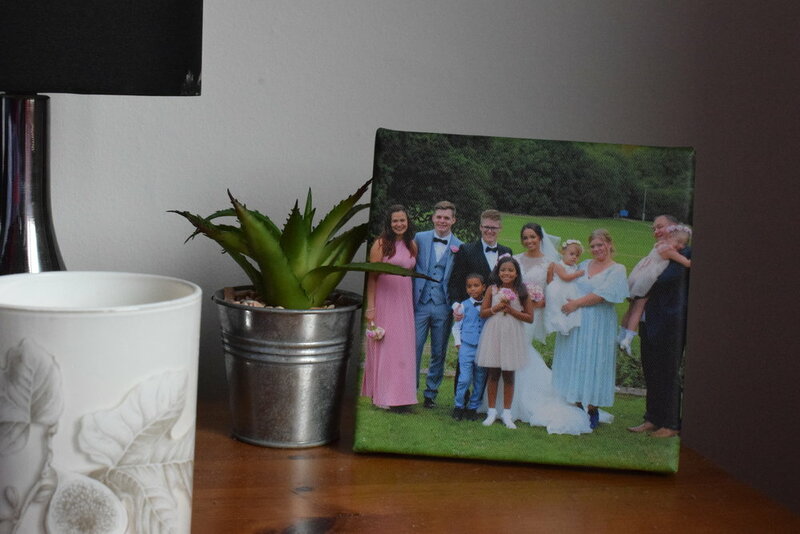 You could also order a more statement pieces like the panorama photo canvas of my brother’s wedding, which includes a photo of all the family that were able to attend. You can also choose a variety of shapes, from your basic square canvas (which are definitely my favourites!) or rectangle ones both in landscape and portrait. There are canvases to suit every budget. The canvases start at just £9.99 for the smallest which are square desk canvases. I ordered one for my parents and one for John’s parents as well as a few Christmas-y (obviously!) ones for me. They come with attachments to stand them on a desk however as with any canvases you can also pop them on the wall just like I did. Alternatively if you prefer, you can also buy some of the larger canvases which are no more than £49.99, meaning there is something for everyone and every budget. Being a company run by photographers who understand images in a personal manner, it is no surprise that the canvases are some of the best quality products I have ever ordered. The photos are printed on premium canvas and stretched across European pine framing. They are then laminated by hand using fine art satin print varnish (allowing for stronger UV protection and colour enhancement) and ensured to stay brighter for longer whilst being protected from everyday life. So even sticky fingers checking out the photos and pointing out people they know, don’t cause lasting damage! There are so many sizes and shapes available on the Parrot Print website and with Christmas just around the corner it's the perfect time to buy. The delivery is free on orders over £20 and they come in secure, protective packaging to ensure they arrive safe and ready to hang. For more reviews of products and services we use in our lives as parents raising our two girls visit my reviews page. If you have any questions about our Parrot Print canvases which I have not covered in this post, feel free to ask in the comments section below. Here are a few thoughts on the beautiful selection of canvases we have thanks to Parrot Print. Here's my review of photo gifts Cheerz offer plus NAOMIXCHEERZ gives £5 off any order over £10.